Unswerving passion for the biological and aquatic sciences which began as a youngster raising tadpoles, fish and plants collected from local ponds gives MarksReef a unique perspective on aquarium maintenance. That perspective allows MarksReef aquariums to beautify and thrive, yet require minimal maintenance. These aquariums are self contained biological systems utilizing low cost Eco­Friendly local resources. 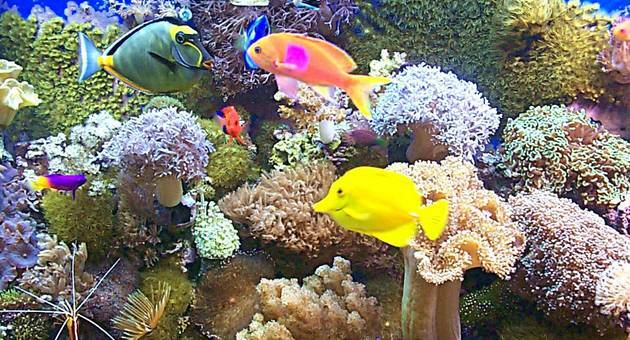 In 1995, Mark co­founded the Wasatch Marine Aquarium Society (www.utahreefs.com). He previously served as President, Treasurer and Membership Coordinator and remains a very active WMAS Lifetime Member. Hundreds of club members received Mark into their homes to welcome them to the group and to learn how they set up their aquariums. 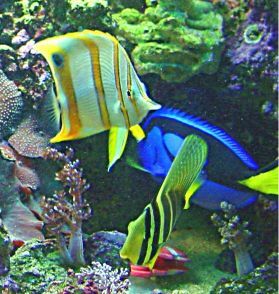 This has provided wide perspective on the relative effectiveness of many different types of aquarium set­ups and maintenance techniques. Over 40 years of experience has led to the current operation of MarksReef Coral Farm. Marine hobbyist magazine called Mark a “brave mountain pioneer” when it came to trying and developing new ideas which always placed his aquariums on the cutting edge of bio­technology. He was one of the first in Utah to breed and raise clownfish. One of Nemo’s cousins, a tank raised Tomato Clownfish is pictured in the logo above. The combination of a love of biology, education (University of Utah B.S. 1979 and M.S. 1982), experience as a business owner, and the skills gained over the years as an extreme hobbyist in the aquarium business, places MarksReef as one of the best aquarium installation and maintenance services in the area. Would you like to have something like this in your home or business? A beautiful object of living visual art, a coral reef aquarium, is better than sculpture or painting, because it moves and grows.